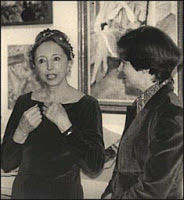 Valerie Harms reviews Anaïs Nin Character Dictionary and Index to Diary Excerpts by Benjamin Franklin V, published by Sky Blue Press, 2009. This publishing event deserves 5 stars. We owe premier Nin scholar Dr. Franklin and publisher Paul Herron a huge debt of gratitude for this book. Benjamin Franklin is Professor Emeritus of English at the University of South Carolina. The author of many books about American authors, plus jazz greats, and several books about Anaïs Nin, Professor Franklin now gives us an invaluable reference book. I wish I’d had it when I was reading all of Nin’s diaries and fiction. Even though I tried to sort out characters myself, especially as I read Nin’s early stories and novel in Northwestern University’s Special Collections Department and eventually compiled Waste of Timelessness and Other Stories as a rare edition. But now the book is available for longterm fans of Nin’s work as well as newcomers. Part Two gives a list of all Nin’s published fiction as well as a list of the characters who appear in each work. Very helpful. The final part of the book indexes the diary excerpts that were not indexed in the published Diary of Anaïs Nin. Thus, many of these come from volumes of the Anaïs: An International Journal. Here one can trace the references to Hugh Guiler, Otto Rank, and many others. This book belongs in the personal library of all those who love Nin’s work and to university and public libraries around the world. This 162 page paperback costs $19.95. Order from your bookstore or visit http://www.skybluepress.com/. This book will help readers more easily understand the origin of the repetitions, continuities and discontinuities within Nin’s oeuvre and to distinguish the intentional from the accidental. – Tristine Rainier, Director, Center for Autobiographic Studies. Once again, Benjamin Franklin V has meticulously explored the domain into which too few Nin scholars have entered: the domain of facts. His achievement is a major gift to Nin scholars and to the future of Nin criticism. – Philip K. Jason, author of Anaïs Nin and Her Critics. Additional note: A Café in Space, The Anaïs Nin Literary Journal, Vol. 6, 2009, edited by Paul Herron, is also available from Sky Blue Press. This issue features excerpts from a newly found trove of letters from Anaïs’ father, Joaquin Nin y Castellanos, to Anaïs. It’s fascinating the material available on the Internet now. I recommend viewing the interview with the elderly Bebe Barron at www.youtube.com/user/TheStevenReigns.